In her book “The Power of Display,” Mary Anne Staniszewski frames the importance of exhibition design as a total whole that acknowledges the vitality, historicity, and the time-and-site-bound character of all aspects of culture. 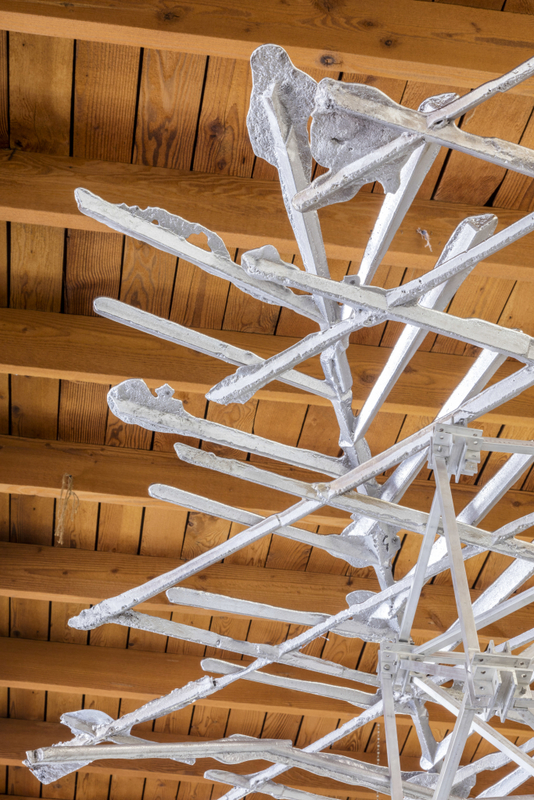 Historically, installation design as a medium and historic category remains a relatively overlooked consideration, holding in its place the significance of discrete objects of art. The fundamental impermanence of Mark Hagen’s installation The Outdoor Type at JOAN is a multilayered manifestation of presence versus absence in perceptual experience to explore the ephemeral nature of exhibitions.The centerpiece of the installation is Ramada JOAN (2015), which is inspired by the temporary or permanent shelters called a ramada – derived from the Spanish word rama meaning “branch” – they were originally built with a roof without walls and constructed with branches or natural materials by aboriginal Americans living in the Southwestern United States. 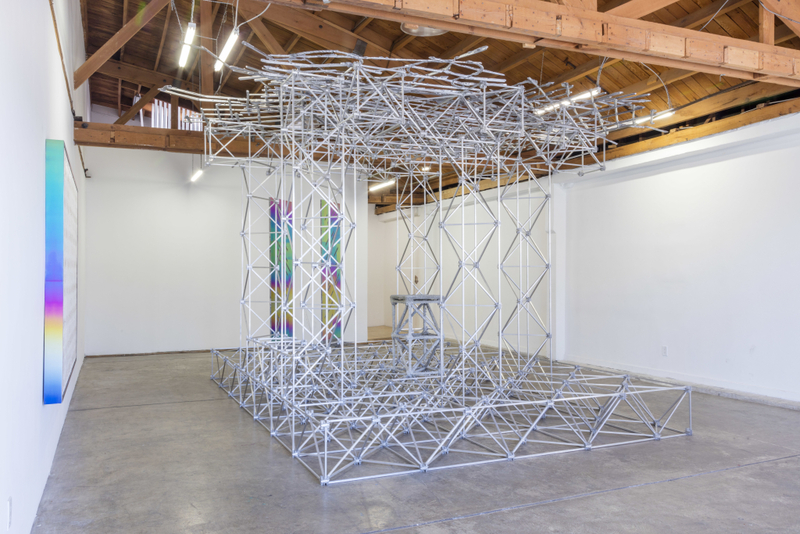 For his installation at JOAN and the fifth iteration of the structures he calls “space frames,” Hagen liberates the architecture of the ramada from today’s conventional civic and corporate zones (bus stops, etc.) and relocates them within their aspirational history, traditionally a means for achieving a democratized, architectural nomadism. Hagen’s Ramada JOAN, is a modular, reconfigurable, unfixed, and incomplete space that can easily expand and contract in time. By retaining the flexible nature of the space frame itself – a series of nodes, pins, and various sized brackets – Hagen potentialities future iterations, additions, subtractions, and/or enhancements by creating a structure with the ability to infinitely repeat itself or take on different forms based on its various locations. 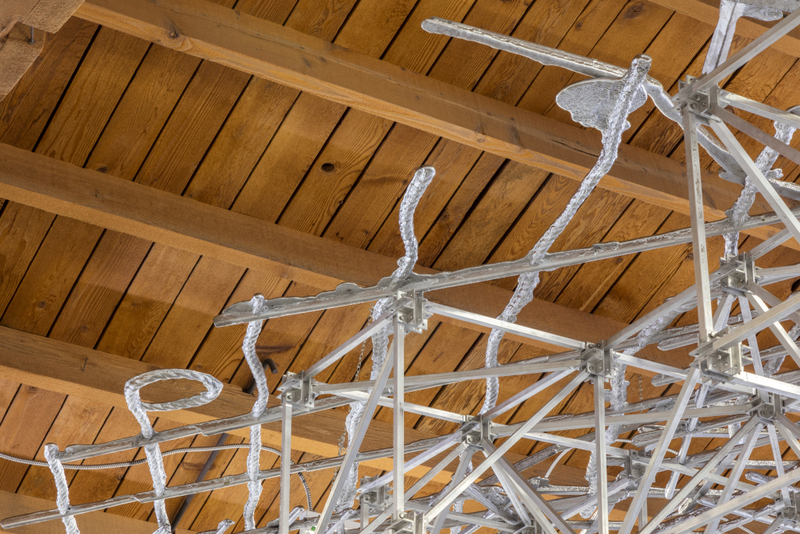 In Ramada JOAN, Hagen’s space frame is composed as a platform with columns, a thatch canopy roof made of metal scraps laid upon each other, contains sails (described later), and displays an unusual object. Rising near the center of the modular grid is a pedestal sprayed with layers of gray papercrete onto its surface. Presented on the top of this pedestal is a non-human cultural artifact, a Neanderthal stone tool that was found in a rock shelter – a shallow cave with protection from the sky but generally without walls – in Caen, France. Approximately dated about 60,000 years old, it predates homo sapiens’ arrival to modern day Europe, or in other words, it predates the realm of what is considered to be the realm of homo sapiens’ cultural production. 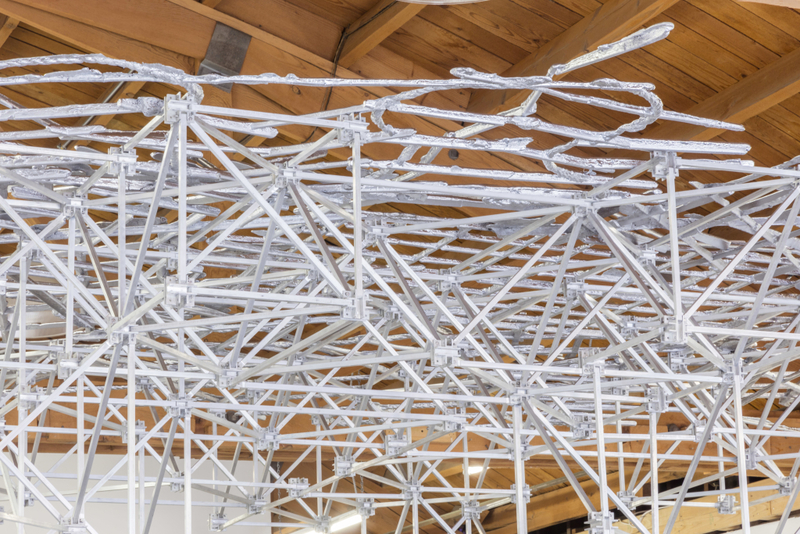 The intervention of object/artifact into the installation of the space frame conjures the literal use-value of the tool from its original time but goes further to imply the physical, albeit conceptual, act of striking and puncturing the sculpture to build it up into a tactile structure/presence that suggests another democratization, that of the idea of culture. Outside of our current era, archeology and its physical, tangible, empirical evidence suggests a reality beyond the present moment. 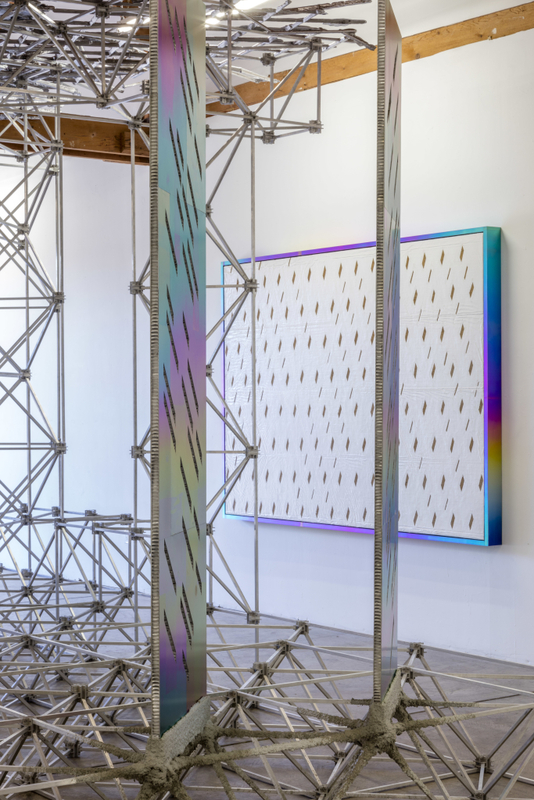 As the viewer walks around the expanse of the space frame, there is the addition of two titanium anodized and etched panels, or sails, as the artist calls them, that contain opposing die-cut diagonal lines that with movement occasionally align to create additional shapes and patterns. The two sails are particularly striking for the intense rainbow effect created by Hagen’s manipulation of oxidation processes and electricity which determine the formal qualities of his work. Both the sails and the final element of The Outdoor Type – the inclusion of a horizontal format pattern painting – are inspired by the accordion folding security screens found throughout Los Angeles’s commercial and industrial spaces. These screens which are fabricated to block and protect yet retain accessibility are used by Hagen to enhance spacial and temporal specificity amongst the viewer. The intensive properties of voltage, acidity, heat, light, viscosity, and gravity drive generate continuums and gradations about vision and looking, but also about blindness and mystery. Not only are these anodized titanium pieces are about vision and color, they integrate the phenomena of natural color while highlighting the limitations of perceptual experience. For example, the light at the blue end of the color spectrum does not travel the whole distance from the sun to us, making the sky blue. This can also be illustrated in considering the subjective visual perception of an individual viewer whose ability to perceive color may be limited to the various spectral colors – violet, blue, green, yellow, orange, and red – less than 1 % of the entire electromagnetic spectrum. 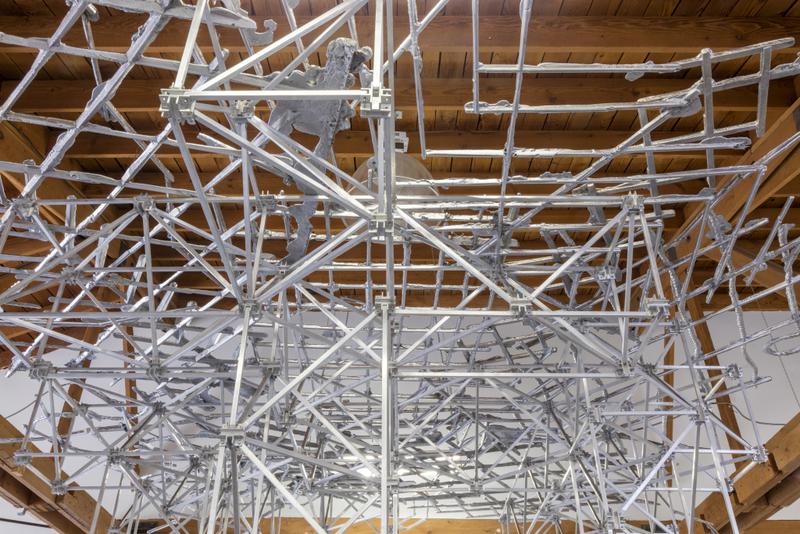 Rather than making the space frame Ramada JOAN a temporal structure or model for viewing an artifact, the impenetrable structure with its repetitive patterns made anachronistically, Hagen foregrounds the illusive singular subjectivity of all participants, from viewer to artist, in order to create a new, expanded vision. Hagen transforms Ramada JOAN into realm of possibility, perhaps even of something else which lacks specific terms or categories. But how do you change terms without creating new ones? In the well-known parable “On Exactitude and Science” by Jorge Luis Borges, the author describes the story of cartographers asked to create a map of a nameless empire in an equal 1:1 scale. The map became so large that it coincided point by point with every area of the imaginary provinces and their vast landscapes. Though it was considered perfect in the field of Geography, the 1:1 scale of the two-dimensional map could never depict the cultural layers of being in a place or the disparate versions of that experience. Considering the Cartesian grids and mapping that influence Hagen, there is another aspect to be noted, the terra incognita, unmarked expanses which remain on old world maps – oceans never crossed, coastlines unexplored. Like the flint artifact displayed as a scientific or archaeological object in an installation method never to be found in a Natural History Museum, Hagen evokes content within the space frame and around the space of JOAN. Another space he creates is the completion of the parable. No representation is complete and every representation is partial, or else it would not be representation. It signifies also that the cartographers knew the limits of the map and awareness of ignorance is not just ignorance; it’s awareness of knowledge’s limits. 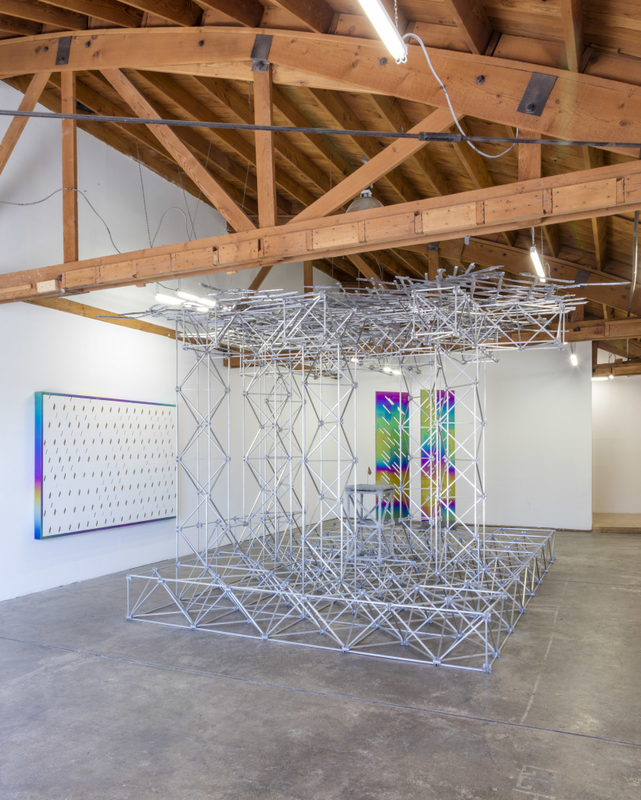 Installation and detail views of Mark Hagen, The Outdoor Type, 2015, JOAN, Los Angeles, photos by Joshua White. 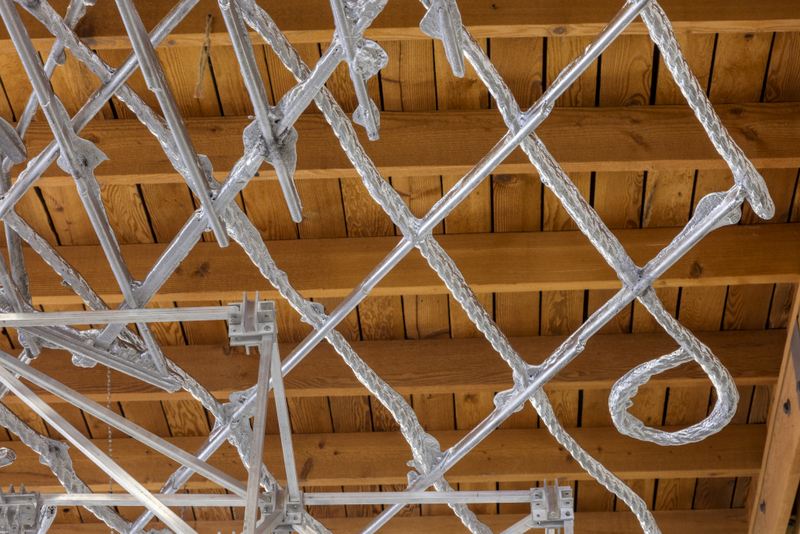 Installation and detail views of Mark Hagen, The Outdoor Type, 2015, JOAN, Los Angeles, photos by Joshua White. 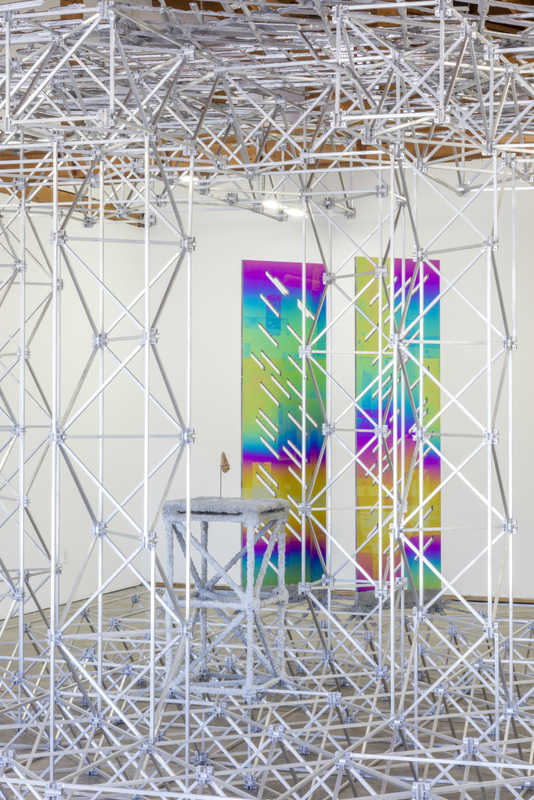 Installation and detail views of Mark Hagen, The Outdoor Type, 2015, JOAN, Los Angeles, photos by Joshua White. Installation and detail views of Mark Hagen, The Outdoor Type, 2015, JOAN, Los Angeles, photos by Joshua White. Installation and detail views of Mark Hagen, The Outdoor Type, 2015, JOAN, Los Angeles, photos by Joshua White. Installation and detail views of Mark Hagen, The Outdoor Type, 2015, JOAN, Los Angeles, photos by Joshua White. Installation and detail views of Mark Hagen, The Outdoor Type, 2015, JOAN, Los Angeles, photos by Joshua White. Installation and detail views of Mark Hagen, The Outdoor Type, 2015, JOAN, Los Angeles, photos by Joshua White. Installation and detail views of Mark Hagen, The Outdoor Type, 2015, JOAN, Los Angeles, photos by Joshua White. Installation and detail views of Mark Hagen, The Outdoor Type, 2015, JOAN, Los Angeles, photos by Joshua White. Installation and detail views of Mark Hagen, The Outdoor Type, 2015, JOAN, Los Angeles, photos by Joshua White. Installation and detail views of Mark Hagen, The Outdoor Type, 2015, JOAN, Los Angeles, photos by Joshua White. Installation and detail views of Mark Hagen, The Outdoor Type, 2015, JOAN, Los Angeles, photos by Joshua White. Installation and detail views of Mark Hagen, The Outdoor Type, 2015, JOAN, Los Angeles, photos by Joshua White. Installation and detail views of Mark Hagen, The Outdoor Type, 2015, JOAN, Los Angeles, photos by Joshua White. Installation and detail views of Mark Hagen, The Outdoor Type, 2015, JOAN, Los Angeles, photos by Joshua White. Installation and detail views of Mark Hagen, The Outdoor Type, 2015, JOAN, Los Angeles, photos by Joshua White. Installation and detail views of Mark Hagen, The Outdoor Type, 2015, JOAN, Los Angeles, photos by Joshua White. Installation and detail views of Mark Hagen, The Outdoor Type, 2015, JOAN, Los Angeles, photos by Joshua White. Installation and detail views of Mark Hagen, The Outdoor Type, 2015, JOAN, Los Angeles, photos by Joshua White. Installation and detail views of Mark Hagen, The Outdoor Type, 2015, JOAN, Los Angeles, photos by Joshua White. Installation and detail views of Mark Hagen, The Outdoor Type, 2015, JOAN, Los Angeles, photos by Joshua White. Installation and detail views of Mark Hagen, The Outdoor Type, 2015, JOAN, Los Angeles, photos by Joshua White. Installation and detail views of Mark Hagen, The Outdoor Type, 2015, JOAN, Los Angeles, photos by Joshua White. Installation and detail views of Mark Hagen, The Outdoor Type, 2015, JOAN, Los Angeles, photos by Joshua White. Installation and detail views of Mark Hagen, The Outdoor Type, 2015, JOAN, Los Angeles, photos by Joshua White. Installation and detail views of Mark Hagen, The Outdoor Type, 2015, JOAN, Los Angeles, photos by Joshua White. Installation and detail views of Mark Hagen, The Outdoor Type, 2015, JOAN, Los Angeles, photos by Joshua White. Installation and detail views of Mark Hagen, The Outdoor Type, 2015, JOAN, Los Angeles, photos by Joshua White. Installation and detail views of Mark Hagen, The Outdoor Type, 2015, JOAN, Los Angeles, photos by Joshua White. Installation and detail views of Mark Hagen, The Outdoor Type, 2015, JOAN, Los Angeles, photos by Joshua White. Installation and detail views of Mark Hagen, The Outdoor Type, 2015, JOAN, Los Angeles, photos by Joshua White. 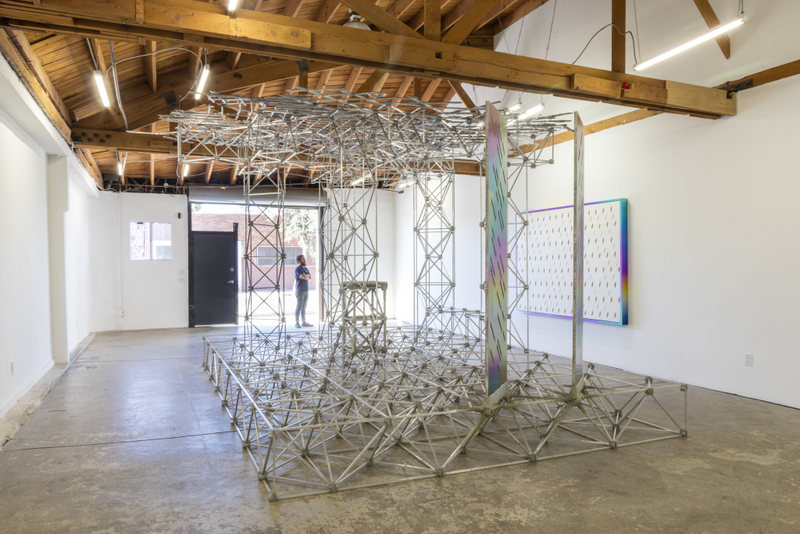 Installation and detail views of Mark Hagen, The Outdoor Type, 2015, JOAN, Los Angeles, photos by Joshua White.